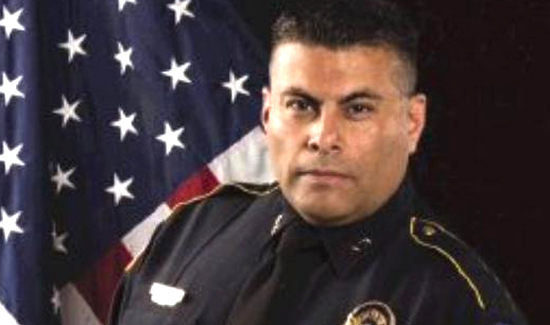 Marshall (TX) — Police Chief Jesus “Eddie” Campa (pictured above) denies targeting officers by secretly installing GPS tracking systems in their patrol cars or making inappropriate public comments about personnel — allegations brought to the city’s attention by the Texas Municipal Police Association. TMPA, a labor organization that aims to safeguard the rights of law enforcement officers and that acts to mediate reported disputes within departments, said some of Marshall police officers have contacted the group to express unhappiness about Campa’s leadership. TMPA North Texas Representative Clint McNear said he believes the Marshall Police Department desires and needs new leadership. “It’s no secret (Campa) has applied (to other departments) and is actively trying to leave and doesn’t want to be there,” McNear said. Campa said he believes he has cooperated with the TMPA’s mediation, having participated in discussions between the organization and the city of Marshall, as well as granting requests made by the group. McNear said several officers reported having GPS devices placed in their vehicles without their knowledge. He said the officers believed they were targeted. Campa said GPS devices were placed on about five officers’ vehicles as a part of a test for a service that allows a business or agency to remotely track a vehicle. “It was an officer safety issue, something that we were testing and looking at. I didn’t think it was that big of a deal,” Campa said. Campa said the officers initially were unaware their vehicles were being outfitted with GPS tracking systems, but there was no reason they were not informed. McNear said his association submitted an open records request to the city to examine MPD’s standard operating procedures for GPS tracking devices, as well as Campa’s emails pertaining to the GPS systems dating to Jan. 1, 2016. Additionally, McNear said Campa reportedly made derogatory comments during an FBI Law Enforcement Executive Development Association class in Louisiana and voiced his concerns in an email to the city. Campa said he was confused by the reports, denying he said anything inappropriate. McNear also said he is looking into allegations of financial misappropriation by Campa and has requested records of all grants received by MPD since Jan. 1, 2015, along with all donations for the K-9 unit, donations for the specified purchase of K-9 ballistic vests, all donations received for hosting of community events and a list of expenditures of D.A.R.E. account funds.